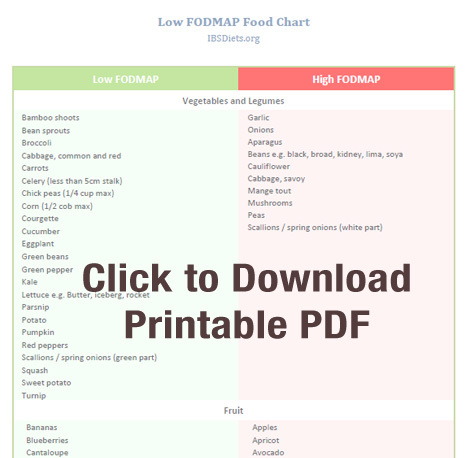 Below is a downloadable low FODMAP diet chart PDF that contains the most common foods in a handy printable format. The chart can be printed and be attached to your fridge or hung on the wall in your kitchen as a quick reference or reminder of what foods are low in FODMAPs and high in FODMAPs. The main high FODMAP foods to avoid are garlic and onions. These foods can be found hidden in many foods that you would not expect so be sure to read through the ingredients list. A good substitute for onion is asafoetida powder. 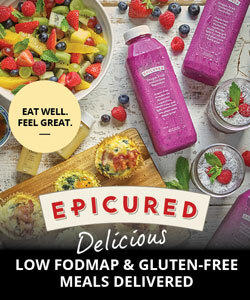 If you would like a more comprehensive list of foods suitable for the diet then head over to the FODMAP food list page. The food list page has a comprehensive list of foods that are both suitable and not suitable to be consumed on the diet. 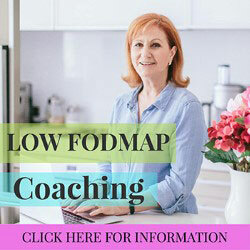 If you are looking for an introduction to the diet the FODMAP diet guide should help provide some information on the diet. 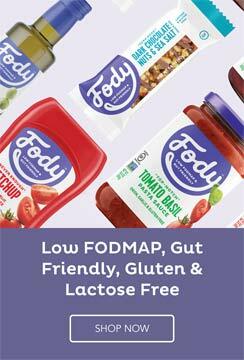 A great accompaniment to this print out is a low FODMAP food diary and symptom tracker that can be downloaded and printed or you can buy a low FODMAP food diary from Amazon specially created by this site. This book has room to store nearly 4 months worth of daily food tracking to help pin point which foods are specifically causing problems for you whilst doing the low FODMAP diet. Click here to take a look at the book.